second. 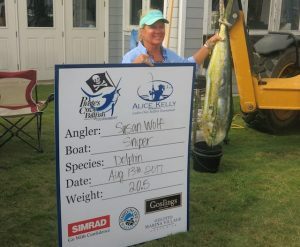 The Alice Kelly Tournament is held to promote and fund breast cancer charities and is one of the most popular and successful ladies only anglers billfishing charity events in the world. And TRUE GRIT was not the only Paul Mann boat to enjoy winning a top award in this year’s Alice Kelly. The ladies team aboard SNIPER, a 58-foot Paul Mann, with owner and captain Jimmy Bayne on the bridge, weighed in a really nice gaffer dolphin to win both the top dolphin and the optional dolphin jackpot of $19,500. Susan Wolf was theangler. Thirteen-year-old Emily Bracher, competing aboard PELICAN, another well-known 56′ Paul Mann with her Uncle Capt. Arch Bracher, earned the Top Junior Angler for the second year in a row after releasing a nice billfish. Summer Bracher, also aboard PELICAN, won the coveted Paula Stanski Award for Angling Excellence. 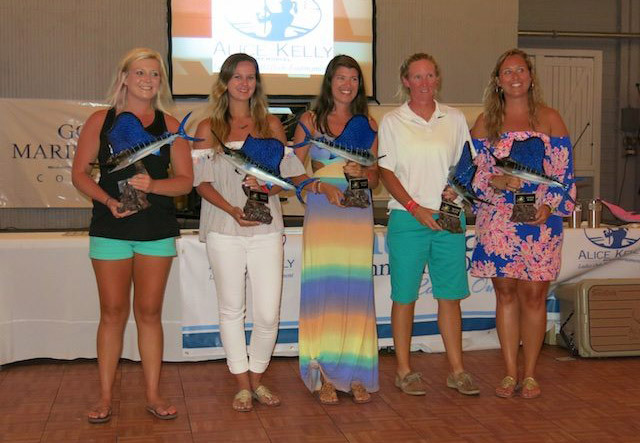 More than 500 lady anglers competed in the Alice Kelly Memorial Ladies Only Billfish Tournament this year. 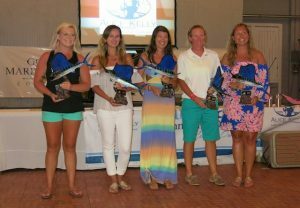 The day started out looking like rain but by “lines out,” at 3:00 P.M. Sunday, a total of 64 billfish had been brought to the boats and released. 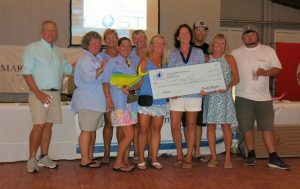 Perhaps most importantly, some very serious money was raised for the Outer Banks Cancer Support Group. All in all, it was some very “pretty work” and congratulations to all the participants and especially the Paul Mann fleet!